The new Hunter Original autumn/winter 2016 campaign - A Hunter Highland Fling - takes us on an adventure through the Scottish Highlands, following a group of young pioneers as they make their way to the summit of a mountain. Under the creative direction of Alasdhair Willis, the model shots for the campaign were captured by acclaimed photographer and filmmaker Elaine Constantine, chosen for her inimitable vision of British youth, which has featured in iconic campaigns and publications such as The Face, Vogue and W magazine. BAFTA nominated for her newly released film, Northern Soul, Elaine coached the cast in order to convey the unique spirit, nostalgia and sense of youthful adventure that runs throughout the campaign. From a picnic complete with sandwiches and a Thermos flask to navigation with orienteering maps and trekking poles, a traditional British adventure is created for the campaign. This campaign develops on the story of the London Fashion Week show, which saw the Scottish glens reappropriated, taking place within a vast urban industrial space with metal waterfalls cutting through the runway. 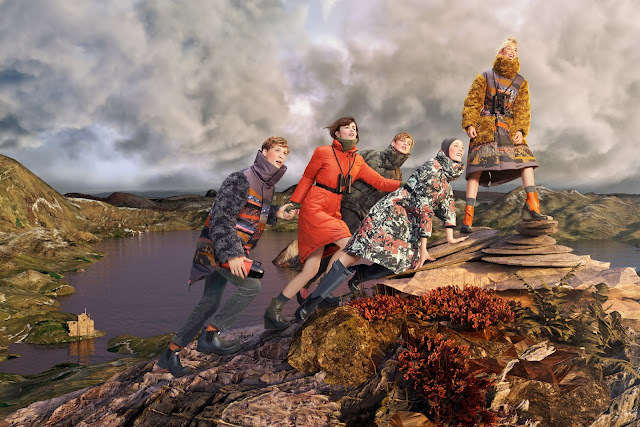 In the spirit of Hunter Original, the Scottish Highlands, the heritage of the brand, are recreated using CGI in a new modern treatment of the brand’s home and heartland, created by pioneering digital artist Thomas Traum. Blurring the digital renders and photography into one, the cast is set within a dramatic and hyperreal Scottish landscape of heathers and lichens, mountains and lakes, in each scene the skies becoming darker as rain clouds roll in. The campaign photography comprises 4 scenes, presenting different stages of the journey through the Highlands, beginning with navigation, followed by a picnic and a landscape of waterfalls, until they reach the summit of the mountain. Hunter will be available in select stores from March 2016.